So finally director Derek Chiu got the chance to show a larger audience his way of filmmaking. He was given this satirical comedy and box office draws such as Miriam Yeung and he indeed scored the biggest hit of his career. The question that arises though: will Derek Chiu be allowed to showcase the skill, that made his smaller films so wonderful, in a commercial movie? The most clever thing about Frugal Game is having the title of it appear 13 minutes into it. Sense a disappointment in that sentence? Well, you're not wrong because Derek Chiu's movie is a bit of a disappointment. To make fun of reality TV nowadays isn't easy because it has become parody in itself. The scriptwriters realizes that and chooses not to parody it extensively throughout. Lee Biu Cheung and Fung Chi Keung make the point that any concept can turn into one of these terrible shows and unfortunately THAT IS reality (Meet my folks - what a joke). There's positive and negative aspects to talk about but the latter overpowers the former sadly. Being a Derek Chiu movie, the narrative is injected with a pleasant quirky atmosphere mildly reminiscent of earlier movies of his and the sometimes frenetic camera language also generates amusing moments. The different segments where the participants are trying out ways to lessen their costs are funny enough and it seems like it's here Derek is putting in more effort. In particular the restaurant scene where their cheapness backfires on them is very successful in combining score and editing with the images. The material dealt with has more potential than what's mentioned above but the writing doesn't allow for any real cleverness to make itself seen. That puts Derek in a more difficult position and he hasn't the confidence, on this project, to make flawed writing better filmmaking. Already from the top the plot setup defies logic to a certain extent. 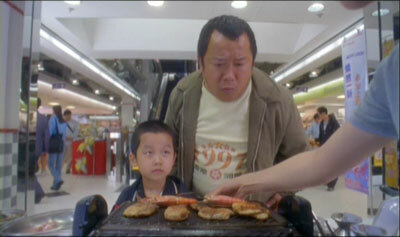 Especially in the way Diana convinces Wai Tai-Hon and his family to take part of 'Frugal Game'. There was need for either an additional scene or more lines to make us fully understand what his reasons truly were. Sure, his family needed the money but I still felt something was missing here. The cast of characters comes off as rather flat and lifeless also. We spend the most time with the Wai family and while you have very likable actors portraying them, only Eric Tsang manages to bring out greater character moments. Inside he's clearly opposed to the idea of having his family exposed like this and we see some sweeter scenes where he must choose what's best for his family. Miriam Yeung have developed a charming screen persona through movies like Love Undercover but there's very little signs of it in Frugal Game. The reason for that is because of the one big mistake the movie does, letting Yeung be a secondary character. Instead Carol Cheng is the leading lady and she has no problems portraying this unsympathetic Diana character but in my view she doesn't carry the movie very well. Here someone like Miriam could've moved things along better with her personality but she's given little do sadly. Frugal Game second half focuses more on the characters, which would be seen as a good thing had we cared more for them. The romance developing between Miriam and Eason feels empty and the behind the scenes intrigue fails to interest this viewer. At 100 minutes it is a bit too long but the cameo appearance by Ti Lung by the end made me smile anyway. I would've liked to see more of the other family competing against the Wai's, the Lai's. Head of that bunch is Wayne Lai (Visible Secret) and he makes the most out of his limited screentime. The actors do seem to enjoy themselves as evident in the NG (bloopers) takes that are in the movie. Shame though that the acting and comedy is in the end nothing more than sporadically enjoyable. Want to add that I think Eason Chan is slowly gaining better screen presence. He plays an ambitious television director here and later in the movie he recruits an older martial arts actor (Ti Lung) for one of his dream projects. Eason has yet gotten the chance to do complex characters but I see potential, more than I can say about the majority of male pop stars in the acting field. Fans of Derek Chiu will see a few glimpses of his touches in Frugal Game and he's more than welcome to try out this genre again. This attempt is fairly enjoyable but with more depth put in at the script stage, this satire could've been more effective. Being a new film this Universe 1.85:1 transfer looks dull. Colours are muted and there lies a softness over the print. It's damage free though but it should've been better coming from Universe. The Cantonese 5.1 Dolby Digital track sticks to center for the clear dialogue and a select few instances of music gets spread out across the front. Detected one heavy use of surround in a rain scene and that sounded just fine. A Mandarin 5.1 dub is also included. The English subtitles does it's job but had a few spelling errors. Some signs with Chinese text does not get translated which is a shame cause there might've been a joke there. Traditional and simplified Chinese subtitles are also included. Extras include a Making Of+Trailer segment that lasts for 3 minutes and 56 seconds. The Making Of is nothing more than a few short interview bits and more NG shots that is then followed by the theatrical trailer. The second extra is the Star's Files section that features text and filmographies on Eason Chan, Do Do Cheng, Miriam Yeung and Eric Tsang. None for director Derek Chiu though.